Room Eight | Hey Woodstock Generation: These are Your Presidential Candidates! Hey Woodstock Generation: These are Your Presidential Candidates! Who will you be voting against this November? That’s really what it comes down to, doesn’t it? The fact is, however, that this poor choice has been a long time coming. All you have to do is look down a level, or two levels, or three levels in politics to see that there is no there there, and the rot has now reached the top of the ticket. You see the same rot at the state and local level, in business, in the non-profit sector. It is the rot of a self-serving generation or two, now running the show in its own interest. And the United States is facing a Presidential campaign that will likely be a rehash of the social issues of Generation Greed’s youth, rather than an honest discussion of the diminished realities it is leaving to those coming after. In public policy, in the economy, even in many families. Scapegoating is likely to be the only discussion of this reality anyone hears about. The candidates will likely prefer to talk about something, anything else otherwise. For decades my rule of thumb has been don’t vote for any Republicans at the federal level, on generational equity grounds, as since 1980 the Republican Party has been waging a financial war on everyone born after 1957. Don’t vote for any Democrats at the local level, because they are controlled by the producers of public services – the public employee unions and contractors – whom they have continually enriched at the expense of increasingly less well off consumers of public services. And don’t vote any incumbents of either party holding office in the State of New York, which is the worst of the worst. Is there any reason to change? Few people are going to vote for Donald Trump. So why vote against Hilary Clinton? There are plenty of reasons. And the real reasons have nothing to do with Whitewater, Benghazi, State Department emails, Vince Foster’s “murder,” and other made up scandals her political opponents have used to demonize her. Hilary Clinton is, first and foremost, a player of the inside Washington game, a game that has nothing to do with the rest of us. And she is hated by other players of the inside Washington game that are, in many ways, just like her, but on the other side. She has been so hated since Watergate, a scandal that, for those not keeping score at home, was more than four decades ago. No, I’m not bothered by, or interested in, any of that. Hilary Clinton has been one of the most investigated people in history, and the only smoking gun they ever came up with was the fact that her husband had some affairs. For some of the things that do bother me, here is a comment made by another reader of The Economist magazine that has a lot of truth to it. They have spent 50 years trying to ‘complete’ the reforms of LBJ, despite the American people telling them that they didn’t much like those reforms, and were unwilling to fund their extensions. Second, they have become the party of the unionized public sector employee, who naturally oppose reform of public services to make them more efficient. Third, they are dominated, intellectually and financially, by upper middle class and rich leaders and donors whose highest priorities are social issues, rather than economic issues. So they seek social reforms, but are satisfied with the economic status quo, particularly the low taxes on the rich part. I think the focus on social issues will fade as the boomers die. When you think about it, we’ve gone from campaigns for women (50% of the population), to blacks (10%), to gays (2-3%), to the transgendered (<<1%). These are all worthy issues, but they can’t be the only thing a national political party is focused on. Sanders campaign gives a warning that the Democrats need to look down from their ivory towers and respond to the unwashed masses by addressing economic issues and how to make government deliver more with a limited budget. I agree. It is also true, however, that whereas the Democrats haven’t had any new economic ideas since 1965, the Republicans haven’t had any original economic ideas since 1980, as I explained here. There ARE no parties of ideas now, just parties of interests. It is the executive/financial class, the political/union class, and the serfs. And no one in politics really cares about the serfs, or about anyone born after 1957 or so. Both the executive/financial class and the political/union class have their hooks in Senator Clinton, as these are the sort of people she socializes with and identifies with. Not the serfs. Now I’ll give Senator Clinton credit for one thing. Perhaps because she is not willing to flat out lie by promising something for nothing, like the rest of the politicians over the past 35 years, she hasn’t made any grand promises she can’t keep. But that means that she has nothing of substance to say whatsoever, in a country faced with the collapse of an unsustainable, debt-fueled consumer economy. Hilary Clinton thinks that because things are fine for people of her generation and social class living in exclusive, affluent places such as Chappaqua, and the economy is recovering in a cyclical sense, things are fine. But things are NOT fine. I’m not a big fan of the “a is associated with b” line of demonization practiced in politics, because if you are going to attract a lot of votes you are going to end up associated with a lot of people. Even if that association is a 40-year marriage. But there is one aspect of President Bill Clinton’s administration that might make me want to vote against Senator Clinton. Going back to the 1970s, the U.S. had a personal income tax code with very high tax rates but with actual revenues reduced by a host of special favors, deals, and exemptions. Democratic President Jimmy Carter called the tax code a disgrace to humanity. Democratic Senator Bill Bradley made a simpler, fairer tax code the centerpiece of his time in public office. In 1986, after a bi-partisan effort, a simplification of the tax code with lower rates and fewer special deals actually passed. The administration of President Bill Clinton reversed it. His tax policy could be described as “here is a special deal for you, and here is a special deal for you, and here is special deal for you. And otherwise, you pay more.” Too often, moreover, the Clintons and Democratic politicians like them have applied the same practices to the spending side of the ledger. Here is a little program for you, and here is a little program for you, and here is another little program for you. Lots of little initiatives and grants, each with their own applications, rules, and evaluations, etc. All of which create little pockets of personal gratitude in the short run, while more basic needs and functions are neglected over the long run. My view is that in the long run, anything that isn’t simple is a ripoff. Particularly at the federal level, the level of government furthest from the people. All these complicated little tax breaks and spending initiatives require lots of people with graduate degrees to manage. In fact, many of them can only be understood, and are perhaps even known about, people with graduate degrees. And lo and behold, one finds that people with graduate degrees end up being the prime beneficiaries of many of these little tax breaks and government programs. Aside from the very rich and those on Wall Street (more on that later) the people who benefitted most from Clinton-era policies were those who are rich enough for it to be worthwhile to itemize their federal personal income tax deductions, rather than taking the standard deduction. But no so rich that those deductions phased out. It was government of, by and for the yuppies, the professors, lawyers, high level civil servants, union leaders, non-profit executives. People like themselves. With no empathy for the losers. In fact, in the 1990s it is only those with graduate degrees or more who saw their average compensation increase when adjusted for inflation. Now I’ve chided those who have become the former middle class for being all too willing, 20 years ago, to blame Blacks, immigrants and those living in older central cities for everyone’s problems, including their own. More recently, since 2000 and to a greater extent since 2008, the loss of moderately paid jobs, the collapse of families, and the increase in substance abuse that once afflicted minority central cities has also afflicted working class and middle class White suburbs. I would hope that among these more recent victims, there might be some honest reflection about what they had been led to believe 20 years ago. What one finds, however, is that there is still no empathy for the losers, no matter who they are. How can Donald Trump get away with saying I love the less educated and have millions of sad and desperate people turn to him? Because it seems clear that Senator Clinton does not love the less educated. Hilary Clinton has forgotten where Bill Clinton comes from. And I’m not the only person who thinks so. One has every reason to fear that Larry Summers, who thought everything was fine until a few years after our unsustainable debt-fueled economy had already nearly collapsed, will be a part of the next Clinton Administration. That is, in and of itself, a reason to vote against her. And, supported first and foremost by the teacher’s union, one wonders if Senator Clinton believes teachers have any obligation to educate children whose parents are not college graduates themselves. Any obligation to educate children who are themselves also unlikely to become college graduates. Because that union always claims no matter how high school spending is, even as high as it is in New York, the serfs aren’t paying them enough. And they deserve more, and more and more from those who have less and less. Those who don’t count. I get the feeling, in fact, that too many of those with graduate degrees, with children who will also pursue graduate degrees, are no longer really in favor of meritocracy and equality of opportunity. They are opposed to any tests that might show their children don’t automatically deserve to be on top. They are uninterested in vocational education, and in favor of education systems that sorts children like their own into the success track very early, and deposits the rest in the social landfill. What you have in the heartlands of the Democratic Party is credentialism and social segregation run amuck, to an extent that one does not fine in the so-called Red States. This social mobility stagnation is added to the traditional Democratic blind spot, dating back to the New Deal, of indifference to our outright opposition to entrepreneurial new businesses, and preference for the ongoing stability of large, existing oligopolistic corporations. Corporations that in this era are less and less likely to serve the public interest, in a country that is becoming more feudal all the time. Corporations that are unlikely to be reformed, and need to be replaced by new companies with visionary founders in charge. Starting with new major banks. Is there any reason to vote for Hillary Clinton? How about this one? Nothing is going to change for the better under a second Clinton Administration, and as a result very few people are going to vote for Senator Clinton. So why should you vote against Donald Trump? Shouldn’t this be a separate post, given how long this post is turning out to be? No. Because having separate posts would make it easier for willfully blind partisan fools to only read what they want to read. So read on. Well, I don’t believe Donald Trump is a racist. He just plays one on TV, because he has no real beliefs and is willing to say anything, even the opposite of what he said the day before, to get ahead. In reality Donald Trump is a conventional Republican with regard to race and immigration, as that party has been dog whistling on race for more than 40 years. In the mid-20th Century there was a political realignment. Before that point the Republicans were the party of snobs and the Democrats were the party of bigots. Afterward the Democrats became the party of snobs, and the Republicans the party of bigots. It was a winning strategy for the Republicans for a long time, but with each generation not only less White but also less bigoted than the one before, that party was heading for demographic oblivion. As the election and re-election of Barack Obama showed. So Republican leaders tried to change course. Donald Trump has not taken the party in a new direction; he has hauled it back to the old direction, all while barking rather than dog whistling. Still I don’t dislike Donald Trump for being a racist. There are plenty of other reasons, real reasons based on his entire life to this point, to vote against him. Consider what I wrote in 2004 when I ran as a minor party protest candidate against the local state assemblyman, against a politician who has recently announced his retirement in favor of a designated successor. Aside from lobbyists who are just out for a dollar, politics appears to be driven by two different concepts of the word “freedom” that emerged in the 1960s and 1970s, one good and the other (for lack of a better word) evil. The good freedom might be called freedom of identity, or of lifestyle. For a brief period after World War II, many Americans believed that if you didn’t look like, act like, think like, and live like everyone else, then you shouldn’t be accepted. The idea of America as a land of social conformity is mostly gone, but politicians can still get elected by manipulating 35 year old resentments with tribal appeals to groups of people, and the invocation of “values” issues on which they have no intention of changing anything. Sadly, tribal politics determines how many people vote, among those who vote at all. They are suckers. Less true than it was 12 years ago, and less true all the time. But Donald Trump has attracted votes for (in the primary) and against (in the general election) by riding the last tribal acts of the last tribal generations. The reduction is social tribalism is one of the few good outcomes of the values of Generation Greed, although many members of that generation never really changed. The evil idea of freedom is freedom from responsibility, which has both a “liberal” and a “conservative” version, depending on which responsibilities one does not want to meet. Liberal Democrats have sought to attract votes by telling the poor and not so poor, the old and not so old, the sick and not so sick, and others that they do not have personal responsibilities to work and earn their own living, or to take care of their family members. To knowledgeable critics, their excuse for irresponsibility has been “social realism, ” the assertion that this is the way people live today (because they are free to live that way) and government programs, paid for by someone else, must limit the damage. And they have cultivated a sense of entitlement to assistance, causing recipients of public benefits to feel anger at anyone who dares to make demands on them in exchange. Conservatives and Republicans have sought to attract votes by telling the better off that they do not have social responsibilities to their communities, to the less well off, to the rest of the world, and to the future, particularly with regard to taxes and debt, but also with regard to the environment. To knowledgeable critics, their excuse for irresponsibility has been “economic realism, ” the assertion that the affluent are self interested and mobile, and if you make demands on them for the benefit of others, or for the benefit of the future, they will take their assets and go elsewhere, leaving you worse off than before. They also cultivate a sense of entitlement, telling the affluent that their position of privilege is the result of their own moral superiority, not social advantages or luck or (as the business scandals show) worse, and that they do not owe anything to anyone in exchange for it. This gets to the heart of what Trump represents. With regard to freedom from responsibility, is there any freer man in America than Donald Trump? Free from most personal, social, business, financial and other responsibilities, The Donald is a man who has always asked the question “Why can’t I have what I want now?” The question is rhetorical. He doesn’t want it answered with reminders of obligations to others. Those others, it seems, are the losers, and he is the winner. Donald Trump has made a living selling his personality and vision to others who are in no position to afford it, and has epitomized the debt-fueled consumption era that has been followed by a perpetual economic twilight — as those debts lead to impoverished old age and stagnant consumer demand. It was an era in which glitz and conspicuous consumption, rather than service and achievement, afforded social status and recognition. And being in with the in crowd at Trump Tower, being treated like a big wheel at a Trump Casino, or being one of the high rollers at a Trump golf course is what gave people meaning to their lives, not religion, family or other social institutions. It isn’t my thing, but I don’t begrudge men and women facing a lifetime tedious work in their jobs, and watching their pennies at home, a night out, dressed up, with a roll of cash and some credit cards in their pockets, buying people drinks and being a big shot, and just for once not worrying about what it costs. Or going to the spa, or the clothing store, or out to eat, and for once not worrying about what it costs. Feeling like James Bond or a Bond Girl, even of they are only at Atlantic City and not Monaco. But in the U.S. economy of the past 35 years it has been the credit card, not the cash, and a whole lifestyle of spending more than you have, not a rare night out. Donald Trump has been a pied piper of that lifestyle. A lifestyle that also asks the question “why can’t I have what I want now?” when one’s spouse turns out not to be James Bond, or becomes too old to be a Bond Girl. The winners deserve better. Including the ability to leave the losers, their obligations, and often their offspring behind. On a personal level, the antipathy of the women of the “women’s liberation” generation toward The Donald is no surprise, because of the new “problem with no name.” While there are certainly some advantages for females as a result the women’s liberation and sexual revolutions of the 1960s and 1970s, it turns out that it wasn’t women who were actually liberated in a “freedom from responsibility” sense. Women ended up with more responsibilities that ever. It is men such as Donald Trump who were actually liberated. Has it all really come to this? In many families, the answer is yes. And while a mixed bag for women, the change in many families has been mostly terrible for children. How have the social battles of the 1960s and early 1970s affected those who were children at the time, and afterward? In addition to being paid less, on average, than those who came before them had been at the same point in their lives. And being forced to pay higher taxes in exchange for diminished public services and decreased benefits. Many Americans in the generations born after 1957 or so also had less stable family lives as children, less stable than their own parents had been provided with by their grandparents. Including the children of Donald Trump. Many families are better, and more child-centered, than ever. But the family situation in which children are raised has become a more personal, more devastating aspect of rising inequality. Rather than face up to the life many Americans are facing, a life amidst the economic and social wreckage many, the campaign is likely to just rehash the “feminazi” versus “male chauvinist pig” arguments of decades ago. From their own youth, the youth that matters to a generation that never grew up. In public policy, meanwhile, “King of Debt” Trump is likely to be a conventional Republican in another sense. Faced with a present that is diminished by the deals of the past, Trump’s only economic answer is likely to be another round of selling off the future to meet the “emergency” of the present. Just like the two prior Republican Presidents who managed to get re-elected. The excess debts from those two prior binges are a big part of what it crippling the U.S. economy today. Do we really need a third national party, on the credit card, with the bill passed to younger generations? In this as well it is some Republicans who are trying to change the party. Not Trump, who is really just trying to hold it back. 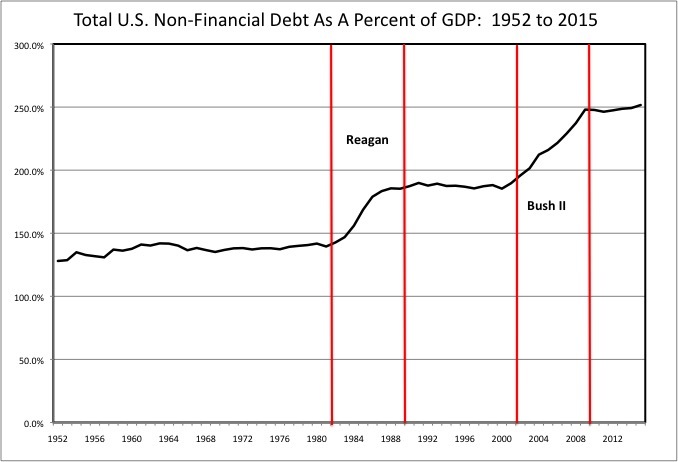 Reagan and Bush II told people that they could pay somewhat lower taxes (and the wealthy could pay much lower taxes), and yet there would be no price to pay for this. The middle class would not only get as much in public services and benefits as they had been promised, they would get even more! It was a lie. A very popular lie. More recently, some Republicans have been willing to tell people that in reality, while Generation Greed would get everything it had promised itself but had been unwilling to pay for, the generations to follow will have to face old age with far less after paying more. That is an unpopular truth, one Democrats don’t want to tell either. Even the Republican voters of Generation Greed, who (based on their votes over 35 years) want to become better off at the expense of their children, don’t want to face the fact that they have done so. Donald Trump has pandered to them by reinstating the lie. Is there any reason to vote for Donald Trump? Perhaps because while Hilary Clinton will competently manage our slow, grinding social and economic decline, The Donald might very well get the whole thing over with in a great big hurry. Shaped by an unpopular war. Those who felt they had to go and fight to do their duty to their country often got screwed. Those who felt they had to pay a price to oppose the war to do their duty to their country often got screwed. The country is being run by those who weaseled out. They are the winners. And The Donald is The man of his generation. But now is not the time to let that generation off the hook. Or the generations that followed Generation Greed, which I refer to as Generation Apathy. Here is another comment in The Economist that I found particularly wise. This election is disappointing, for a bunch of reasons. It has also revealed some disturbing things about us. I’ll start off with the obvious, we have 320+ million people, and the best we can find is Clinton (let’s be honest, she’s heavily favored to win)? Next, people want to take the easy way out. We have a candidate who pretends that deporting Mexicans and “being tough” (whatever that means) will fix the economy. We have another who is so far right that his own party hates him and wants to undo the massive social progress we have made in the past 50 years. Finally, we have a candidate who pretends we can have free college and healthcare that is paid for by a couple of billionaires. Hillary is trying to have it both ways, which makes me dislike her even more. We brought this all on ourselves. Mad about gridlock? Why didn’t you vote in the 2010 elections that brought the Republicans back to Congress after Obama gave you the ACA and stimulus? The fact that you DIDN’T vote tells me something. You took the time to vote in 2008, why couldn’t you do that again? Mad about trade with China? How many of you are willing to spend more for American made goods? I’m guessing you actually aren’t. I’m sure I’ll get a bunch of replies saying “I’m ok with it! I’ll gladly pay more.” That’s fine, but almost 70% are not. If that were an election, it would be a joke. Plus, why is Walmart so big? Why is Amazon so big? Every dollar you spend there is another reason to trade with China. Only a handful of the 10 most sold cars in the USA are American. You made that. Are you mad about our stingy welfare state? Again, why didn’t you vote in 2010 when Obama and the Democrats were in Congress? More importantly, we are not willing to pay for it. And if we are, it’s NO WHERE near enough. To be fair, I’m not picking on Sanders alone. EVERYONE is guilty of this. And everyone thinks there’s this pile of Scrooge McDuck-like money just sitting around that’s not being shared because of greed. It’s a complete fantasy. If you want all this stuff (like healthcare) or American-made goods, we need to pay more. And it’s very clear we are not willing to do that. We are not willing to make any sacrifices (that would imply we would be better off in the long run, which I’m not so sure about). We want simple “solutions” to complicated problems. Ever heard of the phrase, “we get the government we deserve”? Well, we got it. And it’s not just the government that has to change. We have to change. This campaign has exposed a flaw in democracy. In a monarchy, when a king abdicates, you get a new king. What happens in a democracy when the people abdicate? Because that is what has happened. The election is not just about voting for President. Who is your representative in Congress? Who are your representatives in the state legislature? Did you vote for them or someone else, and why? Most people don’t know. Beyond voting, what if no one decent runs, because the game is rigged to keep anyone from outside off the ballot, and no outsider other than a celebrity such as Donald Trump gets any attention from the media? Is THIS the best we can do? It gets worse the lower you go. No one I know has ever really considered running for any office. I did only out of a sense of responsibility and concern – what if no one does? This is participatory democracy? How about voting the party line? Does that make any sense at all? What do those parties stand for? As best as I can tell, based on what they actually do in places such as New York, the Democrats believe the political/union class should get even further ahead at the expense of the less well off serfs. Perhaps rationalizing this with the idea that if insiders get one or more years in retirement for each year worked, with lower expectations even when they are working, somehow they will have to provide the same to everyone else someday, paid for with Scrooge McDuck money. Even as active and retired public employees “vote” for lower pay and benefits for everyone else every time they go shopping, and the smart people in places like Chappaqua have their houses cleaned by illegal immigrants earning half the minimum wage. But the Democrats are also fine with allowing the executive/financial class to get ahead at the expense of the serfs too. In which administration was the tax rate on capital gains income slashed relative to the tax rate on labor income? The administration of President Bill Clinton. As best as I can tell, Republicans believe the executive/financial class should get ahead at the expense of the serfs, with tax cuts and corporate welfare. And the enrichment of those who have their hooks into the political system, where people have no choice but to pay. When Donald Trump says he knows how to work the government, and got whatever he wanted, as a former city planner in New York I can tell you that he is absolutely correct. But the Republicans are also OK with deals with the political/union class to get ahead at the expense of the serfs too. Since those Republicans who matter don’t need public services and are happy to trade them away to the political/union class in exchange for political support. No one is standing up for anyone born after 1957 or so, who seem to have no representatives at all. Will anything be left when Generation Greed is gone, or are we heading for an institutional collapse? How could either of these candidates, whose very lives scream “I want it all and I want it now,” lead a country in which a large share of the population is faced with making painful adjustments to conserve their own future, and our collective future? How could that seem, coming from them, as anything other than hypocrisy? Hey Woodstock Generation, these are your Presidential candidates. And this situation, and where we are heading, is on you. While (typically) ignoring the generational equity aspect of the situation, someone writing in the NY Times agrees. And was given enough space to write the whole thing out.